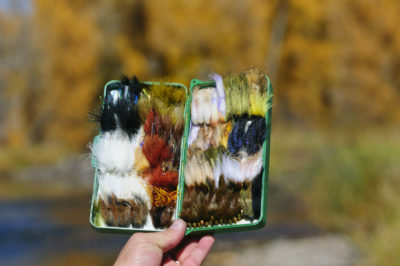 Autumn is one of the best times of the year to fish with streamers. Many anglers get trapped in a rut and rarely do anything but nymph-fish. It’s important to remain open-minded, experiment with your tactics and techniques, and think outside the box from time to time. During the autumn months, I typically carry a separate rod rigged with two streamers so that I have the flexibility to change tactics when necessary. I’ll routinely nymph a riffle or run first, then come back through with a tandem streamer rig looking for any opportunistic feeders that I may have missed. Some of the biggest fish of the year are fooled with streamers between September and November. Make sure you carry an ample supply of streamers this time of year. I recommend using a tandem rig, with one light streamer as the lead fly, trailing a darker offering behind it. Some of my favorite streamers include: Size 1/0-2 Barr’s Meat Whistle (black, olive, white, ginger, and brown), 8-10 Crystal Bugger (white, and olive), 8-10 Heng’s Autumn Splendor, 10 Pine Squirrel Leech (natural), 10 Goat Leech (brown and black), 2-6 Bennett’s Lunch Money (rainbow trout, easter bunny, olive, brown trout, sculpin brown, and black), Barr’s Slump Buster (natural, olive, and rust), and a Cone Head Sculpin. When I am walk-wading, I typically fish these with a floating line, but don’t rule out using a Scientific Anglers Sonar Sink 25 Cold to increase your sink rates when your fishing from a drift boat or inflatable raft. It is designed with a 25 foot sinking head that gets your streamers deep quickly. When you want to get “down and dirty”, this fly line is a must-have!